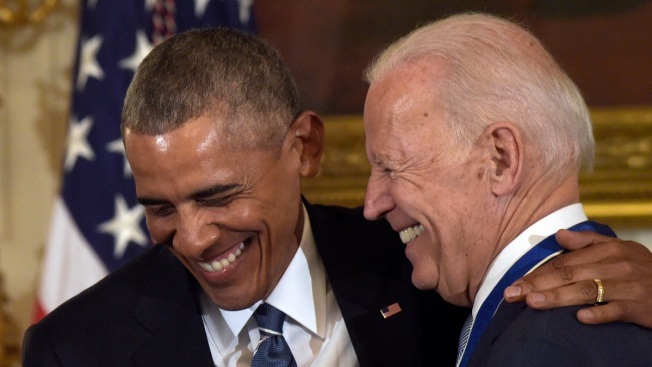 Former President Barack Obama laughs with former Vice President Joe Biden during a ceremony in the State Dining Room of the White House in Washington, Thursday, Jan. 12, 2017. Obama presented Biden with the Presidential Medal of Freedom. The friendship between former President Barack Obama and former Vice President Joe Biden is being immortalized in a new show titled "Barry & Joe: The Animated Series," created by director and writer Adam Reid, NBC News reported. In the trailer of the adult animated sci-fi sitcom, Obama and Biden travel back in time after the inauguration of the 45th President of the United States, Donald Trump, with the mission to alter the course of history and save the future. Barry and Joe, as they are affectionately called in the series, are guided through history's ups and downs by present day astrophysicist Neil deGrasse Tyson. Tyson appears in the form of an augmented reality that only they can see. Reid launched a fundraising page to produce the sitcom on Kickstarter, with a goal of $100,000 to produce the prologue show open and a mini episode pilot.